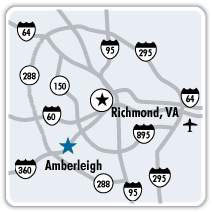 Want to learn more about what Amberleigh has to offer? Simply fill in the required fields below and someone will contact you as soon as possible. But to get the true feeling of Amberleigh, you have to actually be here. Simply stop by and visit one of our furnished models. Models are open 10:00 AM to 5:00 PM Monday through Saturday and 1:00 PM to 5:00 PM Sunday or by appointment. To make an appointment for a tour, call R.E. Collier Inc. - Builder at 804-276-4134. We look forward to meeting you!